Ashampoo Photo Commander 9 is the ideal companion for all management, optimization and editing processes concerning digital photos and multimedia files. 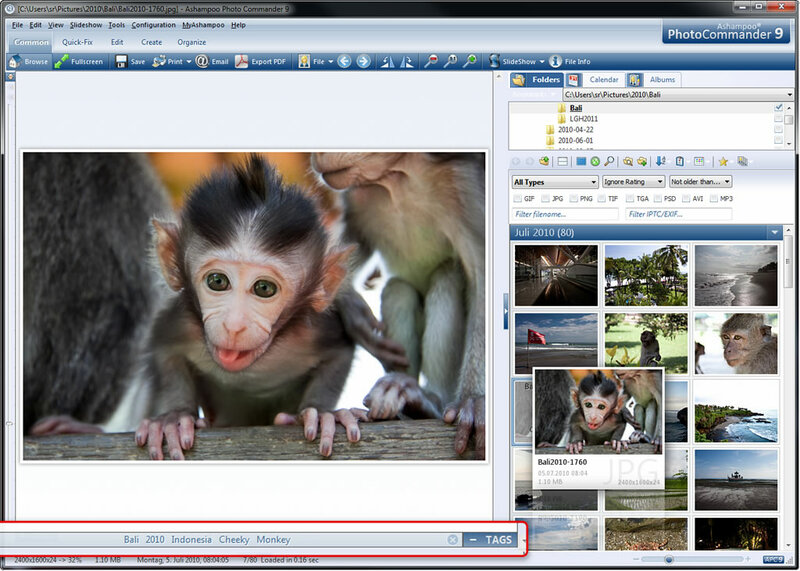 Ashampoo Photo Commander 9 provides users with a quick and straightforward management of photo collections including extensive options such as a miniature view with grouping function or virtual picture albums. Ashampoo Photo Commander 9's user interface is designed clearly and intuitively. Ashampoo Photo Commander 9's user interface is designed clearly and intuitively. It's easy to rotate pictures, adjust horizontal nonalignment, crop images, remove red eyes etc. With just a click photos can be optimized or changed using effects, e.g. inversion or pixelization and can be compared with the original photo in the dual-view mode during editing. Ashampoo Photo Commander 9 offers several exciting features to present one's photos. Pictures can be put together in a slideshow or in an HTML album. Collages as well as greeting cards or calendars are also easily produced in next to no time. Moreover, Ashampoo Photo Commander 9 enables users to make screenshots, scan images as well as print photos, send pictures by e-mail or burn them on a disc. Ashampoo Photo Commander 9 offers new features and improvements, like for example the dual-view mode and the ITCP wizard as well as new editing tools, functions and effects. Web based file manager for IIS (5, 6) servers. It looks like �Windows Explorer�. Qweas is providing links to Ashampoo Photo Commander 9 9.4.2 as a courtesy, and makes no representations regarding Ashampoo Photo Commander 9 or any other applications or any information related thereto. Any questions, complaints or claims regarding this application Ashampoo Photo Commander 9 9.4.2 must be directed to the appropriate software vendor. You may click the publisher link of Ashampoo Photo Commander 9 on the top of this page to get more details about the vendor.